Rhonda was settled in the early 1880s, and a cemetery gate shows that it was there by 1881. Census figures are hard to come by, but there were about 75 Rondans living there when the school opened in 1893. A post office opened in 1889 but moved to Harrold in 1907. Likewise, the Ronda school consolidated with the Harrold school in 1929. Today nothing remains of the town but the Ronda Cemetery. The Rhonda cemetery is one of the many "haunted cemeteries" featured in Olyve Hallmark Abbott's Ghosts in the Graveyard. I'm glad I finally found some information on the real story of Ronda. My family moved to Vernon in my early teen years, and I attended and graduated school from Harrold, TX. 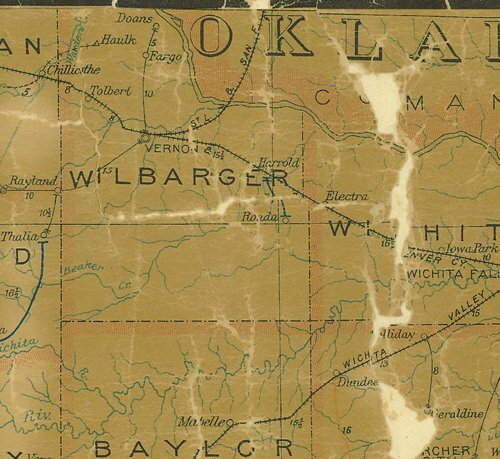 I knew of some of the history of Harrold, such as it was founded by ranch hands from the Waggoner ranch. I had never known of the consolidation of Harrold and Ronda, or of the relocation of Ronda's postal office to Harrold. What is funny, is after I graduated, I moved on over to Electra. On the weekends us kids would go out into the country, and find us a deserted county road to drink beer. And on one of these such outings, we ran across the Ronda cemetery by pure coincindance. We pulled into what we thought was just a pasture gate to turn around and go back to town, when we looked up and saw the big iron gate header with the words "RHONDA" and I believe the date read 1893 ( it's been 25 years) Well needless to say we were all very intrigued. It was really spooky, this cemetery out in the middle of nowhere and miles from anything. If you didn't know where to look, you would probably drive right by it without even knowing it was there. We got out and climbed the gate and walked in with only a dim lit flashlight. There was four of us boys, and our imaginations were running wild. As we reached what ancient tombstones that were still erect, we could feel our skin crawling, and felt as if something was hiding in every shadow. We read what tombstones we could, and every one that we could read had a death date within the same few years..... all around 1893. There were several babies, and most were of a young age, in their 30's & 40's. So we were now even more intrigued. We eventually left, and went back to Electra. The next day, we had a story to tell all our friends, but I was still interested in this "ghost" cemetery. I had a neighbor who was in his 80's and was quite the character...... so that afternoon I couldn't help but go ask him about this amazing place I had found. He proceeded to tell us the "history" of Ronda.